Get your adrenaline pumping or kick back and relax. From white sand beaches and glistening blue bays to thrilling adventure activities, Kapalua Resort has something for any desire. 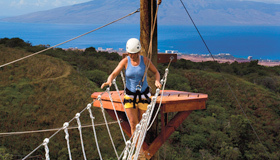 Perched high above the Kapalua Resort, over 2 miles of ziplines whisk guests across the gulches on the West Maui Montains. Side by side ziplines, a high ropes course, “giant swing”, and the state’s largest suspension bridge are all part of this exhilarating activity. Sculpted out of lush tropical foliage, the Kapalua Tennis Garden provides players the perfect setting for a friendly game or intense competition. Coupled with expert instruction, a full service pro shop, and year round events, the Tennis Garden is designed for the novice and pro alike. From the mountain to the sea, Kapalua Resort has miles of trails for every kind of hiker. Take a gentle stroll along sand dunes on the coastal trail boardwalk or step back in time as you explore a plethora of plant and tree species in the Maunalei Arboretum. Award-winning beaches and pristine bays gracefully form the Kapalua coastline. Teaming with marine life, they are sure to be favored by everyone from avid sun-seekers to water sports enthusiasts. ￼The Ritz-Carlton, Kapalua is proud to offer Jean-Michel Cousteau’s Ambassadors of the Environment program, which features an environmental and cultural education center with excursions led by expert naturalists. You can hike through the Hawaiian rainforest, snorkel among Maui’s beautiful coral reefs and participate in underwater photography sessions while exploring nature’s relevance to the Hawaiian culture. The Ambassadors program creates opportunities for each participant to learn about Hawaii’s unique environment, while demonstrating connections to the larger global systems. There is no more special of a place to host your special event. From weddings to corporate events, let the captivating beauty of Kapalua make your event on you will never forget. Inspired by Waihua, pure water Hawaiians believed to have healing powers, The Ritz-Carlton Spa, Kapalua offers guests the opportunity to experience this centuries-old tradition with treatments based on native practices. Therapies draw on plants, flowers and fruits from throughout Hawaii and herbs cultivated in our very own organic garden. Private cabanas are perfect for couple’s treatments and outdoor gardens provide a serene setting for pre- or post-treatment relaxation. Get your adrenaline pumping with thrilling adventure activities or kick back and relax on our white sand beaches.